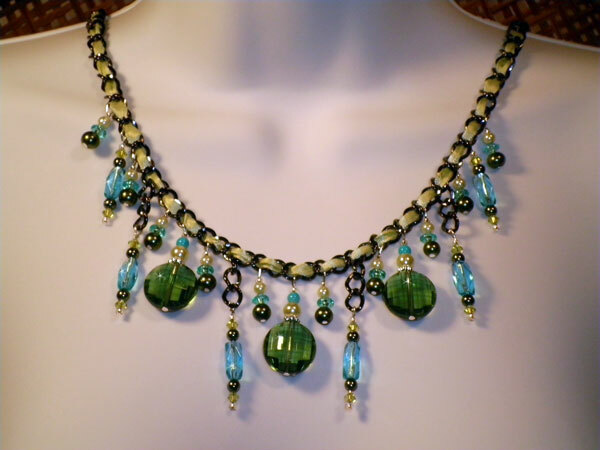 This piece measures 23" with 1 1/2" added from the center dangle. Rather than black chain alone, I've run a beautiful light sage ribbon through it. From that I have dangled a variety of beads including 3 fully faceted acrylic coins in dark green, small glass rounds, acrylic saucers and faceted glass rectangles in turquoise, both small and larger olive pearl beads, and large & small pearl rounds and small glass bicones in the same light sage as the ribbon. Silver seeds and spacers add a bit more sparkle. This is weighty and hangs beautifully. I love the way this came out and you will see more use of ribbon in my pieces in the future.